We didn’t know humpbacks sing at all until 1967. Scientists have been investigating who sings, why and when ever since. They once thought only males sing during breeding season on a population’s winter breeding grounds but now know some whales sing at other times, as well—like, while foraging in summer feeding grounds in the Antarctic. Did they always, or is climate change a factor? Read more here. Listen to a snippet of whale song here. Read the study and listen to two snippets of whale song here. After the orca named Tilikum killed trainer Dawn Brancheau at SeaWorld Orlando on 2/24/10, OSHA ruled that SeaWorld knowingly put trainers at risk and that trainers had to stay out of the water and behind barriers when working with orcas until SeaWorld changed its ways. SeaWorld appealed, lost and hasn’t put trainers back in the water yet, but it’s still fighting the ruling and flaunting other parts of it. OSHA apparently became aware of this when a news station helicopter shot video of trainers getting too close to orcas in September. That video is hard to track, but this video of a 9/26/12 killer-whale show documents similar violations: no barriers between trainers and orcas, and many instances of trainers putting themselves in harm’s way. OSHA wants to talk to three SeaWorld managers about what’s going on, but SeaWorld isn’t cooperating, so OSHA has asked a federal court to intercede. Read more here, here, here and here. Reuters reports that SeaWorld Parks & Enter-tainment may start selling stock to raise cash to plough back into the business of keeping dolphins and whales in tanks. Best possible outcomes: 1. Nobody buys and SeaWorld fails. 2. A wealthy activist or coalition snaps up the stock and forces SeaWorld, now privately held, to answer for its practices and change its ways. Read more here. See the wound under this dolphin’s jaw? An orca named Nakai suffered a similar but worse one at SeaWorld San Diego in September (see Sept 28, below). USDA inspectors decided he’d hurt himself on a gate track, and it seems this dolphin hurt herself on something sharp, too. Faulty pool-drain covers were another hazard at SWSA: one the park ignored even after a sea lion got caught in a drain and drowned until the USDA said fix it or else. By Neal Morton, San Antonio-Express News (12/12/12). Days after news breaks that a dolphin bit a girl’s hand at SeaWorld Orlando, Elizabeth Batt reports on a worse incident at Dolphin Discovery in Isla Mujeres, where a dolphin named Picasso (1 of 13 taken from the wild) bit 3 of 8 people standing in a pool, splashing him & a female, as directed. The victims were all women, one badly hurt. The staff offered no explanation for the attack—only apologies and refunds. Read more here & here. Hats off to U-T San Diego reporter Jeanette Steele for her fine, fact-filled 12/1 story on the Navy’s plans to use robots to do some of the mine- & enemy-diver-detecting work it now uses dolphins and sea lions to do. Too bad about the lighthearted lead, though: “Are dolphins being downsized?” Sadly, no. The Navy and too many U.S. citizens still have no problem with using these supremely intelligent, sensitive, self-aware beings for military purposes. Read Steele’s story here. It’s hard to tell from this footage, taken by a crittercam attached to the back of a blue whale feeding off Southern California in Summer 2010, but you’re seeing this whale do a 360° barrel roll to the right while lunging up at a patch of krill near the surface to position its jaw exactly right to swallow the most krill in a single gulp. The researchers who filmed this behavior report that blue whales (largest of all whales and biggest animal ever to live on Earth) seem to employ this maneuver selectively — only when they determine it will actually help them catch more krill in a patch they’ve targeted, and sometimes while searching for another patch to eat. Learn more here. Read the full study and see more photos here. The dolphins we seem to be swimming with in this video, taken by a crittercam attached to one animal’s back, are members of Hawaii’s genetically distinct population of false killer whales, of which there are only about 150 left. The NRDC petitioned NMFS to add them to the endangered species list in October 2009 and sued in May 2012 to prod the agency to take action. Finally, it has. As of December 28, these insular, close-knit, near-shore-dwelling creatures will be listed as endangered, obliging the government to try to protect them. Read the NRDC’s press release here. See more video here. Read the ruling in the Federal Register and learn more about these lovely creatures here. There are only about 400 left, and the waters off Jacksonville, FL are their only known calv-ing area. You’d think people would want to pro-tect it, and many are trying. But what chance do the whales have when a court lets the Navy build an Undersea Warfare Training Range in these same waters and the Navy won’t even stop exercises while the whales are there giving birth? Learn more here, here, here and here. Aerial surveyors off San Diego got lucky on 5/14/11. First they saw sperm whales for the first time in 4 years of work. Then they saw Risso’s dolphins trailed by north-ern right whales charge the adult sperms, making them cluster around calves and possibly regurgitate food, after which all 3 species mingled calmly. By Cathy Bacon & Chip Johnson, Currents (Fall, 2012). Listen to this recording and see if it doesn’t sound like human voices—like the muffled sound of people talking and making silly noises, as if you were listening from a distance or from underwater or through a thick pane of glass… the way captive belugas do. That’s what you’re hearing: a captive beluga voluntarily mimicking human speech. His name was NOC. He’s dead now. He belonged to the U.S. Navy. His keepers caught on to him when a diver in his tank thought he heard a person tell him to get out. Famed Navy dolphin doctor Sam Ridgway says NOC wasn’t the first beluga to mimic humans and probably won’t be the last. Why he and his fellow researchers waited until now to share this recording isn’t clear. Learn more here, here, here and here. The Navy admits that Low Frequency Ac-tive (LFA) sonar harms and kills dolphins and whales but plans to blast 70% of the world’s oceans with it, anyway. The National Marine Fisheries Service, charged with protecting marine mammals, said, “Go head.” NRDC and other groups are fighting. Read more here, here and here. Visit the wild orcas of the Pacific Northwest with HSI senior scientist Naomi Rose and Death at SeaWorld author David Kirby, and meet ex-SeaWorld trainers who say they knew nothing about how orcas live in the wild when they worked at SeaWorld and anyone who wants to work with captives should see how Nature meant orcas to live first. To empty its dolphin tank, MN Zoo has sent wild-born Semo, 48 (left), to Six Flags in CA and captive-born Allie, 25, to IL’s Brookfield Zoo. Officials say it’s OK, they aren’t bonded. But they had shared a tank since Allie & her mom came from FL in 08, Semo & Allie made two babies (1 stillborn) and it’s been the two of them since Allie’s mom & 2nd calf died in 2/11 & 2/12. These photos show a wound to Nakai after a run-in on 9/20 with male orcas Keet, 19, and Ike, 10. Aggression? Pool injury? Unclear. Ike also got a nasty cut in July. Nakai was born at SWSD. His mom, fearsome Kasatka, is carrying her 2nd calf conceived via A.I. Ike was born at SW Orlando, sent to Canada and brought back to SWSD last Nov. Keet was born at SW San Antonio, bounced all over & returned to SWSD in Feb. Read more here & here. Gillnet fishermen in the Gulf of Maine are lax about using pingers to warn harbor porpoises away from their invisible, deadly nets, so NOAA decided to close the fishery in Oct/Nov when porpoises migrate through. The industry argued that this is their best season and the porpoises don’t show up until later, so NOAA has moved the closure to Feb/March. The industry is happy. Dolphin advocates are not. This baby Amazon River Dolphin, or Boto, was rescued on Bolivia’s Pailas River on 8/23/10 from what isn’t clear. Maybe a fishing net, polluted waters, starvation, slaughter. Multiple threats put the species at risk. The good news: Bolivian President Evo Morales has enacted a law to protect survivors and what’s left of their habitat. AP, Washington Postn (9/18/12). Researchers knew that, among resident orcas in the Pacific Northwest, at least, moms and kids stay together for life and Mom’s life can be long. After midlife menopause, she can live into her 90s. Now they’ve learned that having Mom around confers major survival benefits on adult kids—especially sons, whose risk of dying triples right after Mom dies. No one’s sure why. By Elizabeth Pennisi, ScienceNow (9/13/12). Norma Connelly of CayCompass reports that a lone male dolphin nicknamed Stinky (and other names) has begun harassing divers and snorkelers in Grand Cayman, and diver Michael Maes posted this video of his encounter with Stinky while diving with his wife, Ellen Cuylaert, and marine biologist Alex Mustard to show this is no joke. Commenter DiveJay says there are actually two dolphins, one non-aggressive, and adds that a wild dolphin in the Seychelles once saved his wife from a Mako shark. Read more here. A pod of 22 pilot whales stranded in south Florida on 9/1. Most died or were euthanized. Five young ones went to a nearby rehab center. Next stop: SeaWorld Orlando. Officials say the goal is to rehab and release them. Better bet: Survivors will remain SeaWorld captives for life. Read more here, here and here. A beluga named Mauyak gave birth on 8/27, and Shedd is touting the event as its 6th successful birth since 1999. Oh? Not said: Mauyak was taken from the wild. Only one of her other babies is still alive at age 5. One died on Day 1. One was stillborn. Another died at a different facility at age 8. Three other captive-borns have died at Shedd for a total of 5 dead, 5 living — giving this baby a 50-50 chance. A captive orca named Kohana, one of 4 sent from SeaWorld to Tenerife’s Loro Parque, has given birth to her 2nd calf at age 10 — too young to breed in the wild. With no older females to teach her about mothering, she rejected her first calf, a male named Adan, and has rejected this female,Victoria, as well. Learn more & see videos here and here. A day after Candace Calloway Whiting posts videos of Six Flags Vajello’s lone killer whale refusing to perform and lunging at a trainer, NBC Chicago posts video of her being moved to SeaWorld San Diego to live with other orcas (who may or may not welcome her) for the first time since coming to the U.S. from France in 2002. See videos here & here. The Spitzbergen population of Arctic-dwelling bowheads was almost wiped out by whaling, so reports of sightings sent scientists rushing to record their calls. And, oh, what they collected! Beautiful songs sung almost nonstop during the depths of Arctic winter in an area they now think may be a wintering and mating ground for these endangered whales. Read the study. Go to wired.com to listen to their songs. Researchers studying the Bottlenose dolphins of Shark Bay, Australia, have long known that some females cover their beaks with sponges while scouring the seabed for prey and teach this skill to their daughters. Now they know that these spongers prefer one another’s company to that of non-spongers, suggesting that this tool-use is part of their unique culture, two traits humans once thought only humans possess. By Dan Vergano, USA Today (7/31/12). So far, the news out of the International Whaling Commission meeting in Panama isn’t great. A bid by Brazil, Argentina, Paraguay & South Africa to create a new South Atlantic Whale Sanctuary was defeated; aboriginal subsistence whaling in Alaska, Russia and St. Vincent’s and the Grenadines was upheld; and South Korea wants to start killing whales in the name of research, just like Japan does. His name means “white fella,” and he’s been giving Australian whale-watchers a thrill each time they see him ever since he was first spotted in 1991. Last seen in 2009, he reappeared in June migrating north off Australia’s east coast with other humpbacks toward the Great Barrier Reef. Word is there’s a white youngster, thought to be his offspring, out there now, too. By Tony Bartlett, Brisbane Times (6/30/12). Thanks to Candace Calloway Whiting for reposting Bo Emerson’s 6/29/12 Atlanta Journal-Constitution report on Georgia Aquarium’s hush-hush plans before the story disappeared, because it’s gone now like it never existed. The crux: It seems GA wants to bring 18 Russian belugas into the U.S. and try to make them breed rather than admit captive breeding doesn’t work. Despite Japan’s efforts to promote eating whale meat, it seems few Japanese do eat it anymore, and 75% of the stock from last summer’s killing season are unsold. Some experts blame Sea Shepherd for scaring off buyers much as it forced the whaling fleet back to port in March with less than 30% of its planned kill. Go, Sea Shepherd! By Justin McCurry, The Guardian (6/14/12). Her name was Jozu. Of the 23 false killer whales (actually dolphins) that SeaWorld has tried to keep alive in captivity—13 taken from the wild, 7 stranded, 3 captive-born—she was the last survivor. Born in Orlando, she died on June 4 at age 18. Only a handful have lived longer: up to 22 years. Most died in days or less than 9 years. Average lifespan in the wild: 60 years. CFNews 13 (6/5/12). In a long-awaited ruling, Judge Ken S. Welsh foiled SeaWorld’s efforts to evade culpability for captive orca Tilikum’s fatal attack on trainer Dawn Brancheau at SW Orlando on 2/24/10 and put trainers back in the water asap despite the now-known risks. SeaWorld may appeal, but the ruling is major: a rare loss for SeaWorld that exposes it for what it—a business that cares about profits above all else. Shedd announces that the white-sided Piquet has born a calf she conceived while on breeding loan to Miami Seaquarium “to help revitalize the struggling species.” Struggling in captivity, that should read. Take Shedd: All four of its adult (female) white-sideds came from the wild. Four others have died. All four captive-bred babies have also died—all within six days. He was named Sully after the hero pilot. Stranded and rehabbed in Curacao, he came to SWSD in 7/10 and got along fine with SWSD’s two older females. But he was too young to breed, and SWSD wants babies, so it acquired a 10-year-old male named Argo from Japan in March. Did that factor into Sully’s death on Wed 5/23? SeaWorld isn’t saying — and won’t unless forced. By Elizabeth Batt, Digital Journal (5/27/12). G.A. wanted a baby beluga and got one, but not for long. It sent captive-born Maris away from her mom and paired her with a male to promote breeding, then tried to teach her how to mother. She was pregnant for 15 months. The baby, born weak, lived 5 days. She died Wed 5/23. By Dorie Turner, AP, Seattle PI (5/23/12). Hawaii’s population of false killer whales (actually dolphins) is down to about 170 members, and with 7 or so dying annually as long-line fishing bycatch, they could soon be gone. The Fisheries Service ruled 18 months ago that they belong on the Endangered Species List but still hasn’t listed them, so the NRDC is suing. By Audrey McAvoy, AP, Honolulu Star Advertiser (5/26/12). Peru Dolphin Deaths — Intentionally Unsolved? Peru’s Sea Institute says it can’t tell what killed the 900 to 3,000 dolphins that have washed up dead. Maybe toxic algae? Critics counter that S.I. examined only two decomposed bodies. ORCA‘s fuller and faster exams found clear evidence of links to the kind of seismic testing U.S.-based BPZ was doing offshore from Jan 31 to April 8. AP, CTV News (5/23/12). Lovely Victoria (left) washed up dead in February (see March 22, below), her body badly bruised. Orca expert Ken Balcomb suspects Navy sonar or bombing practice. The Navy admits doing harm but says this time “it wasn’t us.” Seismic testing? Canadian Naval exercises? We may never know. By Ashley Ahearn, NPR (5/16/12). Maris, the captive-born beluga that Georgia Aquarium separated from her mother and paired with a male to promote breeding, gave birth on Friday, 5/18. The female calf is weak and thin. To prevent people from blaming captivity, G.A. said in a press release that first pregnancies often go badly for belugas, captive or wild. Not said: captives rarely conceive, and their babies usually die. Humans cover their ears against loud noises. Toothed whales do something like it. U. of Hawaii scientists found that when a false killer whale named Kina knew loud sound was coming, she could internally muffle its impact. Meaning: if we can find a way to warn dolphins and whales before blasting the ocean with sound maybe they can protect their hearing, too. By Victoria Gill, BBC Nature News (5/17/12). Marion Cotillard plays an orca trainer in “Rust & Bone,” now screening at Cannes. In interviews, Cotillard, known as an animal-welfare activist, says she feels guilty about working with captive orcas at Marineland France. Rightly. 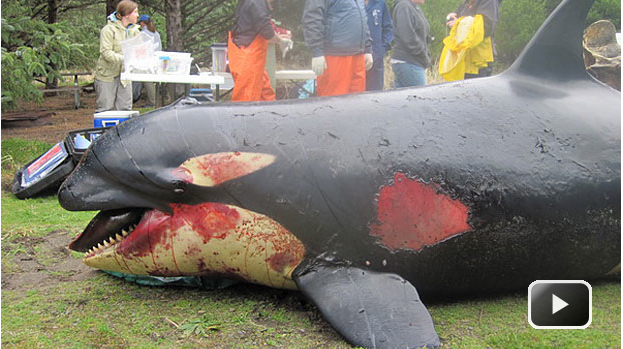 Twenty orcas have died there since 1971. Freya, 30+, was captured in ’82. Wikie, 11, was inseminated at age 8 and forced to make a captive baby. Marion, can you name the orcas you worked with? All the human actors get screen credits. The orcas don’t. Dolphin Safe Tuna Label on the Way Out? The Hill’s Erik Wasson reports in On The Money that the WTO appeals court has ruled that the “dolphin-safe” tuna label is an unfair barrier to tuna trade from Mexico. Wasson predicts the ruling will enrage U.S. activists. But should it? Read pro-Mexico consultant Mark J. Robertson’s ICTDS article on how outdated and misleading the label is and you think maybe the label should go. Read the comment Robertson believes dolphin-safe-tuna-campaign originator Earth Island Institute posted accusing Robertson of biased reporting and you’re not so sure. (5/16/12). MN Zoo plans to give up its last two surviving dolphins, wild-caught Semo (left) and captive-born Allie, and not keep dolphins anymore. Too costly, it says, possibly angling for more state funds to upgrade. Expensive, indeed. To get a sense of what captivity has cost dolphins at MN zoo alone, view this photo gallery. Note names. Track transfers. Count deaths. By Jessica Fleming, Pioneer Press (5/14/12). That’s what it looked like, at least. Told of an orca attack on a gray whale calf—drive off mom, feast on baby—filmmakers arrived to see the attack disrupted by charging, trumpeting humpbacks, probably females. To view the video, click the image, then click the BBC video. By Ella Davies, BBC Nature News (5/9/12). In new research showing how alike humans and dolphins are, scientists studying cooperative fishing in Laguna, Brazil found that while some local dolphins work with humans generation after generation, others don’t — suggesting that those who do teach their kids how to do it the same way fishermen teach their kids how to work with the dolphins. By Jennifer Welsch, LiveScience. (5/1/12). Officials blamed bad vet care when Shadow & Chalmers died at Swiss Connyland Zoo in November. Now they think a two-day rave on zoo grounds factored in. Someone gave the dolphins deadly opiates, but who? Ravers? Staff? Advocates hold the zoo responsible either way. By Rob Preece, Mail Online (5/6/12). Bottlenose dolphins Misha and Tom, captured off Izmir, Turkey, have spent six of their 12 years years of life in a small, filthy pool in Turkey, where people paid to swim with them. Now, a group called Back to the Blue is trying to prepare them for release back into the wild. By Ivan Watson, CNN (4/5/12). Report includes video. The 2009 film “The Cove“ exposed the yearly dolphin slaughter in Taiji, Japan. And still it continues. Now, Taiji plans to turn another cove into a marine park where people can pay to play with the dolphins Taiji rounds up but doesn’t kill for meat or sell to existing parks — a slaughter side-business that may have sparked the whole idea. AFP (5/1/12). Scientists know he’s an adult male by his dorsal fin. They can’t say if he’s albino until they see his eyes: red or not. Researcher & captivity critic Erich Hoyt and team spotted “Iceberg” while doing a census of Russian orcas, who are now being targeted for capture for marine parks. By Richard Black, BBC News (4/22/12). The story includes video. Newly designated Camden Sound Marine Park NE of Broome will protect waters where 1,000 whales come annually to calve and breed, and will restrict fishing and other activities to preserve the marine environment and its other resi-dents: dugong, dolphins, sawfish, crocs. AP, Herald Sun (4/19/12). The video is old (1997), and the dolphins are captive (Theater of the Sea). But the footage is fascinating. Thanks to Lisa Dobi for sending it. The cat is probably dead now. May he have lived long. The dolphins didn’t. Shiloh and Thunder died at Theater of the Sea at age ten & 12. Their dad and Thunder’s mom are also dead. Shiloh’s mom is the only one alive. In the wild, she’d learn to mother from other belugas. But Maris, left, was born in a tank, so humans are trying to prep her for her June calf. Captive births are rare; babies usually die. Maris & baby-daddy Beethoven are exceptions. Maris’s mom, Natasha, is at SeaWorld Texas. They were split up to get Maris to breed. Sadly, it worked. By Dorie Turner, AP, Philly.com (4/12/12). It isn’t hundreds of dolphins washing up dead and dying along Peru’s north coast. It’s thousands — possibly as many as 2,800 by recent estimate. Marine mammal veterinarian Carlos Yaipen, left, founder of ORCA Peru, has examined about 20 bodies so far, and all have shown internal injuries consistent with “major acoustic impact,” which may not so much have killed the animals outright as sent them fleeing en masse to the surface and shore to die on land. A deadly virus or pathogen may or may not also be contributing to the die-offs — it hasn’t been confirmed or ruled out. But acoustic impact is definitely involved. By Barbara Fraser, San Francisco Chronicle (4/7/12). Researchers using sound monitors to listen for whales have found that sperm whales, for one, have left the Gulf Spill area. Not surprising, but science likes data, and this not-so-new way of collecting it (Paul Spong has long studied orcas this way) could prove a better, cheaper way to count and detect marine mammals and make sure they’re not around when the Navy does sonar testing. By Peter Gwynne, Inside Science (4/5/12). The day after news breaks that seismic testing has been halted in the Gulf of Mexico until after dolphin calving season, news arrives that hundreds of dolphins are washing up dead on Peru’s north coast and that these deaths are being linked to other seismic testing. By Candace Calloway Whiting, Seattle PI (4/3/12). To see a brief, grisly video report, click here. There are only 400 right whales left on the planet, so researchers track how many are born each year on their calving grounds off the GA-FL coast. This year’s total: 6 vs. about 20 a year for the past decade. Not good. Let it be noted that the U.S. Navy chose this very area for a huge Undersea Warfare Training Range and refused to stop exercises during calving season. (See March 15, below.) AP, IndependentMail.com (4/2/12). Imagine you’re a wild dolphin never touched by a human before and suddenly you’re being manhandled like this. 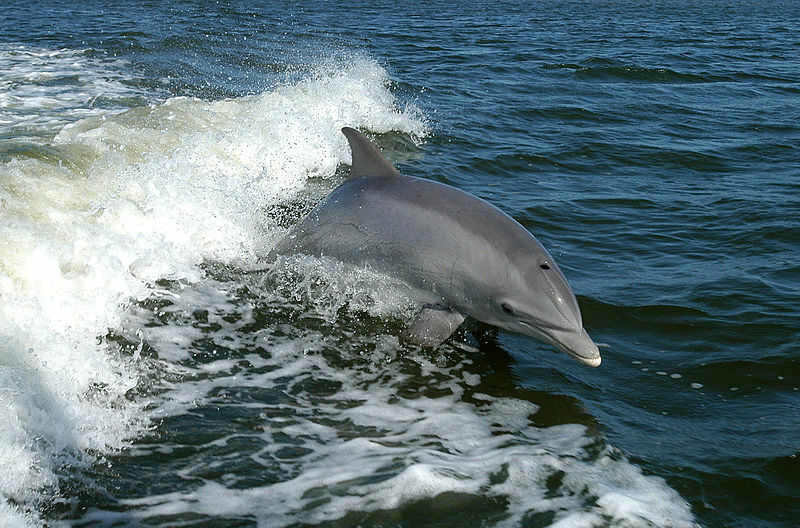 The only possible justification: results of similar capture-and-release exams of 32 Bottlenose dolphins in the Northern Gulf of Mexico indicate that the effects of the Great Spill and the toxic dispersants used to make it go away are still with us and still killing. These dolphins are sick — so sick that researchers think many may die. One already has. By Mark Schleifstein, The Times-Picayune (3/23/12). Kina, left, a false killer whale (a species of dolphin) caught by the Navy in 1987, has spent the past 19 years in a bay pen at U of Hawaii’s Institute of Marine Biology — alone, but at least not in a tank — where scientists use her to study dolphin sonar. Their new study probes how dolphins alter sound beams for different sonaring tasks and how keen this sonar is: Kina can tell apart 2 cylinders whose only difference is that one has walls .008 inch thicker. By Victoria Gill, BBC Nature News (3/22/12). This young female washed up dead in Long Beach, WA on Feb 11, and orca expert Ken Balcomb suspects she died in an explosion connected to U.S. or Canadian Naval exercises and that other members of her family may have died, too. Click the image to see a 2:18 video report. By Lisa Johnson & Lisa Cordasco, CBC News. (3/22/12). The arrival of any dolphin or whale from Japan, where thousands of dolphins are slaughtered annually in Taiji and a few go to marine parks, is offensive and suspect. This pilot whale has allegedly been at a Japanese park since stranding in 2004 and the park now thinks he’d be happier at SeaWorld, which happens to be building its captive collection. How convenient! By Tony Perry, L.A. Times (3/19/12). The Sea Shepherd ship Bob Barker returned to Australia after chasing the Japanese whaling fleet out of the Southern Ocean and back to Japan with less than a third of the 1,000 whales it planned to kill. After years of battle, the mere sight of Sea Sheperd approaching seemed enough to get the fleet to end this season’s hunt. By Phil Mercer, Voice of America (3/14/12). Advocates Ask Judge to Tell Navy: Leave Right Whales Alone! In 2010, the Navy decided to build a huge Undersea Warfare Training Range off Georgia-Florida, right next to the calving grounds of the world’s last right whales (400 left). HSUS, NRDC and other groups sued. A judge heard arguments today and said she’d rule soon. When these groups asked the Navy to halt exercises at least during calving season, the Navy said no. By Russ Bynum, AP (3/15/12). This video shot was four days ago when some 30 dolphins suddenly stranded on a Brazil beach and humans rushed to their aid. The rescue was rough and may have caused injuries, but the dolphins seem to swim off, so perhaps all ended well. By Gerd Traue, YouTube (3/5/12). Less than 3 months after moving a 9-year-old male named Ikaika (Ike) from Canada to San Diego, SeaWorld has shipped a 19-year-old male named Keet from San Antonio to San Diego, too. It’s the fifth time Keet has had to endure the stress and disruption of relocation, all to promote breeding. By Mike Lee, U-T San Diego (2/27/12). HKA came under fire when news broke that it had flown five dolphins believed captured in Japan’s Taiji killing cove from Osaka to Hanoi for marine parks to claim. Activists want HKA to decline future transports. But HKA likes the money, wants more, pled ignorance on the issues and (ready?) says it will donate some of the blood-money it makes to animal-welfare. By Mike King, The Journal of Commerce (2/27/12). This is what the future holds for the captured Taiji dolphins now if they survive: life in a tank — in the case of Nellie (left), 59 years in a tank since her birth to wild-caught parents at Marineland of Florida on Feb 27, 1953. The photo of her could be an old one. Judging from the way her keepers are soft-pedaling this birthday and her behavior of late, it seems they could be anticipating another bulletin about Nellie to follow soon — news of her death. By Jacques Estes, The Daytona Beach News-Journal (2/27/12). Researchers from the Australian Antarctic Division were seeking blue whales when they chanced on a pod of about 12 Shepherd’s beaked whales instead — a species so reclusive only two have ever been seen before, and they’ve never been filmed, ever. ABC News Australia (2/23/12). Read more here. Not for the first or last time, dolphin brain expert Lori Marino and ethicist Tom White argued at an AAAS meeting that mounting evidence of how smart, self-aware and human-like dolphins are suggests they deserve equal protections under the law — which would mean no more keeping them captive, among other things. BBC News (2/21/12). As Tim Johnson explains in this report, gray whales once swam in the north Atlantic and Pacific. Atlantic grays were wiped out by whaling. Surviving Western and Eastern Pacific grays are thought to migrate north-south from feeding to breeding grounds along opposite continental coasts. Scientists worry that gas-oil drilling in the Western grays’ Russian feeding grounds may doom them. But a few have now been tracked making amazing, perhaps survival-driven journeys to surprising parts of the globe. Varvara (left) just swam from Russia’s Sakhalin Island across to Alaska and down to Baja. Whoa! What’s next? By Tim Johnson, McClatchy Newspapers, The Kansas City Star (2/16/12). Love this page. Thank you for all the updated information that never seems to make the news. As a huge lover of Killer Whales I was lucky to fall upon this site. Thank you! Thank you so much! Your kind words will help keep me going! Here is an article that etatmise a population of 1,665 sperm whales in the Gulf. All of this is new to me. Interesting and disturbing, in parts. Biologists with the Minerals Management Service are attempting to identify the fish and squid species preferred by the etatmised 1,665 sperm whales that call the Gulf their home. Gulf sperm whales are genetically distinct and smaller than sperm whales found in other oceans. Research indicates that the Gulf sperm whale subspecies can sustain no more than an average 2.8 human-caused deaths each year without threatening its recovery to a non-endangered status.